The two most difficult days in Bangkok writer Poke Rafferty's life begin with an emergency visit from Edward Dell, the almost-boyfriend of his teenage daughter, Miaow. The boy's father, Buddy, a late-middle-aged womanizer who has moved to Bangkok for happy hunting, has disappeared, and money is being siphoned out of his bank and credit card accounts. It soon becomes apparent that Buddy is in the hands of a pair of killers who prey on Bangkok's -sexpats-; when the accounts are empty, he'll be found, like a dozen others, floating facedown in a Bangkok canal with a weighted cast on his unbroken leg. His money is already almost gone. Over forty-eight frantic hours, Poke does everything he can to work the case before it's too late for him to do any good. Bangkok is a city unlike any other, and Hallinan's excellent Poke Rafferty series brings it to vivid, messy life for mystery lovers. Over the course of several books, Hallinan does a great job invigorating readers' senses, provoking thought with his plotlines and underlying issues, and engaging the emotions through the characters and their relationships. It's a well-rounded, multi-layered series that offers plenty within its pages. This eighth instalment sees travel writer turned sleuth Poke Rafferty on an interesting precipice, personally. His wife and love of his life, former Patpong bar queen Rose, is heavily pregnant. Their 'modern family', which includes streetgirl-turned-adopted daughter Miaow, is about to grow. But Rose is worried due to her history that she hasn't shared with Poke. Meanwhile a friend of Miaow's is worried about his wayward father vanishing; Rose is keen to get Poke investigating, out of the way. 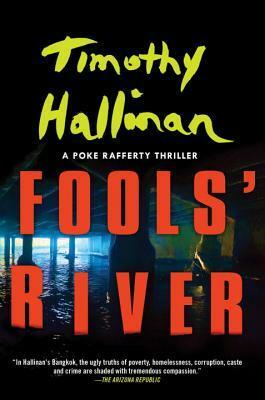 Reading a Timothy Hallinan book is a delight. There's a wee zing to his writing that combined with the vibrancy and complexity of the setting brings something little fresh to his crime tales. There's plenty going on away from the main mystery plot, and interesting character arcs or progressions for long-time fans of the series. I'm not sure if this would be the best first introduction to the Poke Rafferty series for new readers, as you'll get even more out of the book if you already understand some of the character relationships and background. It could be read as a standalone, and is a very good read regardless, but for me personally I'd advise going back and sampling a few of the earlier tales first. You may well find yourself devouring them all, book after book. Another very good read from a very good writer.